Soon after we moved to Cuenca, I got to meet a weaver named Gertie. She took me to her friend Rommie's show of Felted Fabrics. 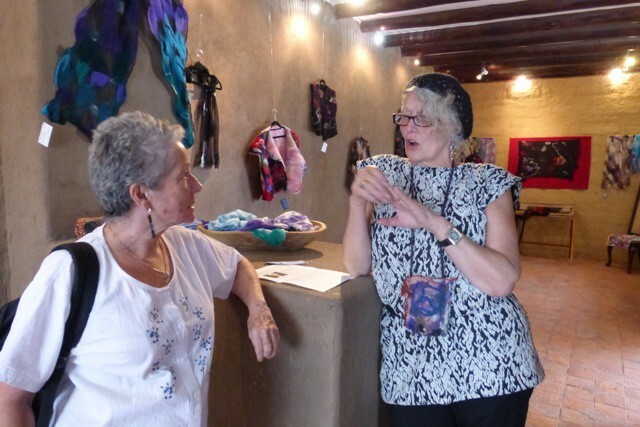 I immediately loved Rommie's design sensibility and found out that she gives classes in weaving, felting, dyeing, shibori and other wonderful things. Gertie, on the left, took me to Rommie's show soon after I moved to Cuenca. So that's how I got to take a class in Felting from Rommie. I learned more about wool and that Ecuador has an abundance of Alpaca fiber at reasonable prices. For the felting we used a combination of wool and alpaca. 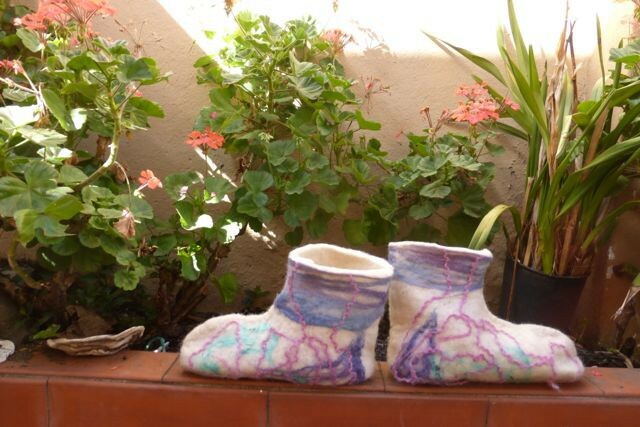 One of my favorite results from that day was my wool booties! Since Rommie is from Austria she knows felted things well and had a bootie form that fit me perfectly. These are my booties drying in the afternoon sun. My husband decided he would love to have felt boots also for hanging around the house so we signed up for another day with Rommie to do more felting. Here Rommie is making sure that Winn's booties are getting enough pressure to make the fiber felted. We also decided to make pot holders out of felt. Winn worked on a big rectangle of white wool decorated with colored alpaca fiber threads. Winn is checking the felting of the pot holder fabric. After it was felted we cut it into pot holder sizes and Rommie taught me how to finish the edges with a blanket stitch. Winn and I are really enjoying our new felted things!